PITTSBURG, Kansas - Yes, woodworking boot camp is a real thing. And it's a week I won't soon forget. 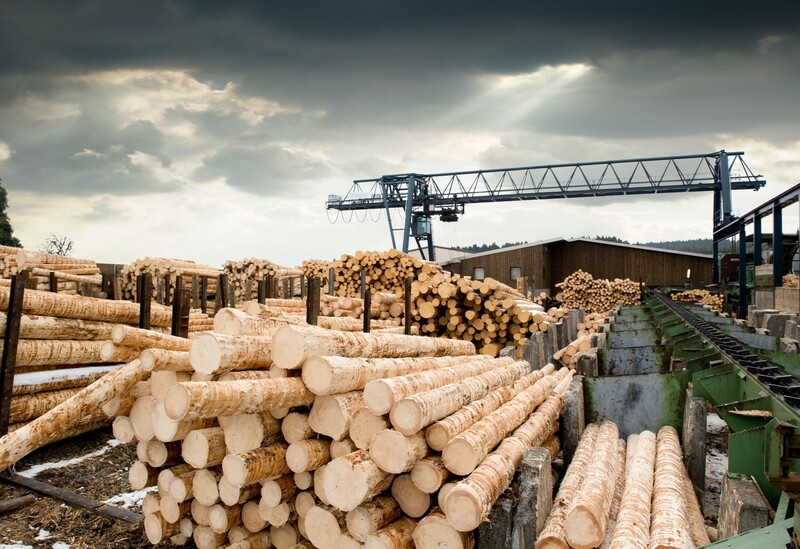 Sponsored by the Woodworking Machinery Industry Association (WMIA) and Pittsburg State University (PSU) in Pittsburg, Kansas, the Woodworking Boot Camp is a five-day instructional course on secondary wood processing fundamentals for sales professionals, managers, product managers, and executives. 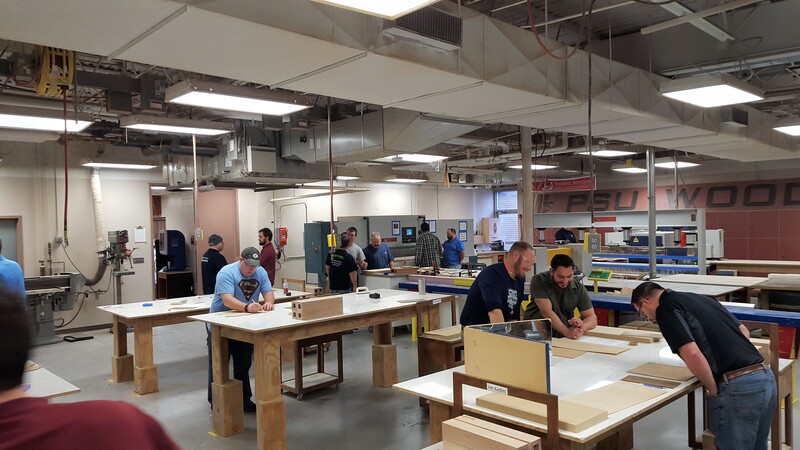 The camp serves to give members of sales, marketing, and executive staff a better understanding of the woodworking industry’s manufacturing process. But students don't sit idly in lectures - though there are plenty of classroom hours during the 50-hour workshop. 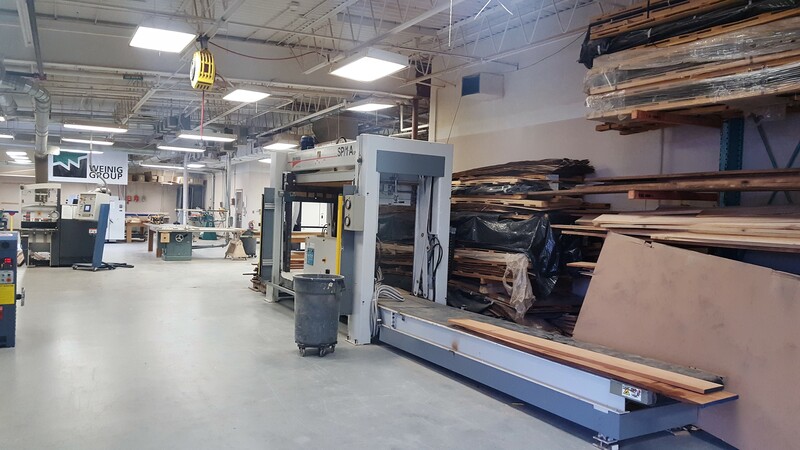 In addition to providing an overview of the wood processing industry, the camp brought me and 15 other students into the PSU wood lab, where we sawed, cut, sanded, joined and finished wood components that embodied the moves of a casegoods producer. The camp is a 50/50 mix of class and lab time, usually beginning with a lecture before moving into the PSU wood lab. "We wanted manufacturers to see the entire process, and how what they do affects the other areas of manufacture," says Doug Hague, assistant professor at PSU and director of the camp. 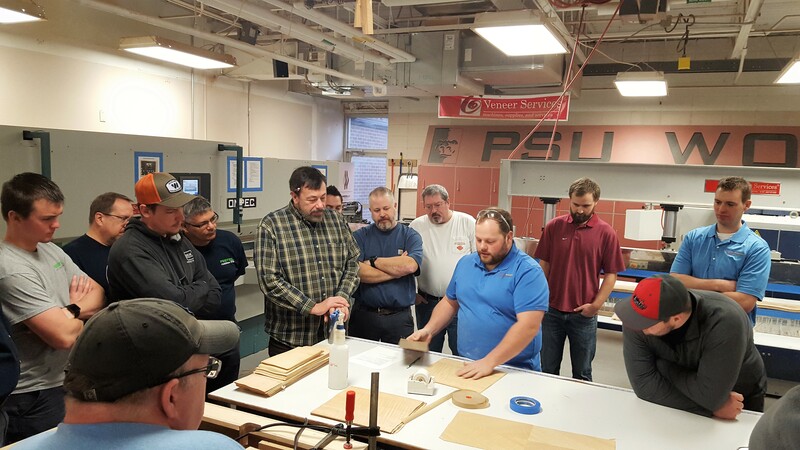 The program was devised, says Hague, as thanks to the many industry suppliers that have generously supported PSU's wood expand sales skills and industry knowledge with a hands-on approach to several fundamental wood processing applications and machines. The $1,950 cost for WMIA members and $2,400 cost for non-members bought five nights' stay at a hotel, ten meals (two per day), a course resource book, materials to build a table and cabinet, and the experience of a lifetime. I had very little woodworking training before the camp – having taken just one measly woodshop class in middle school. I was worried I would feel out of place. But my fears were quickly overcome. I soon learned that many of the 15 other guys were just as clueless as me. The camp is a 50/50 mix of class time and lab time, typically beginning with a lecture before moving into the wood lab for further instruction. Hard works pays off: The mahogany coffee table I built at boot camp. Beginning at 7 am each morning and getting back to our rooms at around 7:30 pm, the program certainly put me to the test. 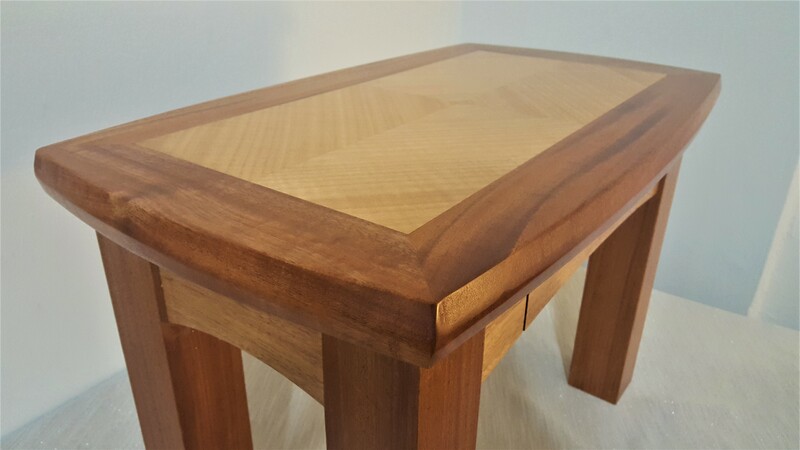 Over four-and-a-half days, we all built our own mahogany coffee table with a diamond matched veneer top, and a small cabinet. Condensing PSU’s four-year wood education program into a week-long course, we learned how to operate the lab’s woodworking machinery, AutoCAD, CAM software, primary processing, finishing, veneering, cabinetry, tooling, millwork, wood science, establishing a dust collection system, OSHA regulations, and facility management. All of that packed into four 12-hour days (and one six-hour) sounds like a lot – and it was. But it was also fun. And incredibly rewarding. Both the table and the desk were shipped to us after the camp, so we even got to keep the items we built. 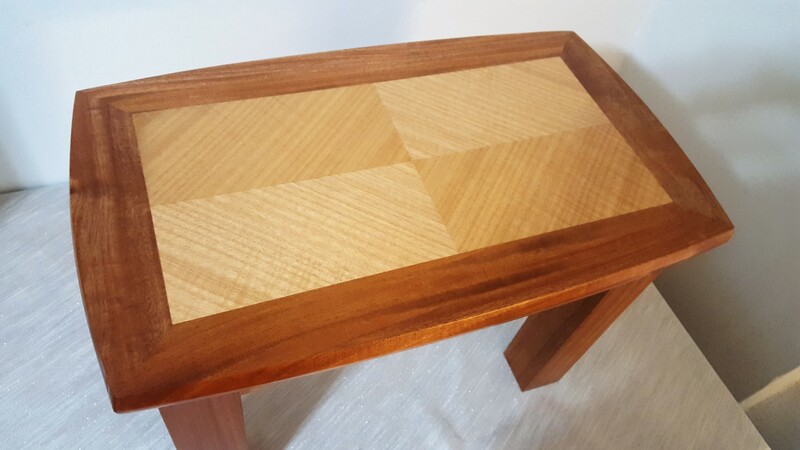 The mahogany table featured a diamond-matched veneer top. My fellow students were mostly salesmen from the supply side of the industry. Two were from Canada’s Doucet Machineries, two were from Scarlett, and six were from Festool. 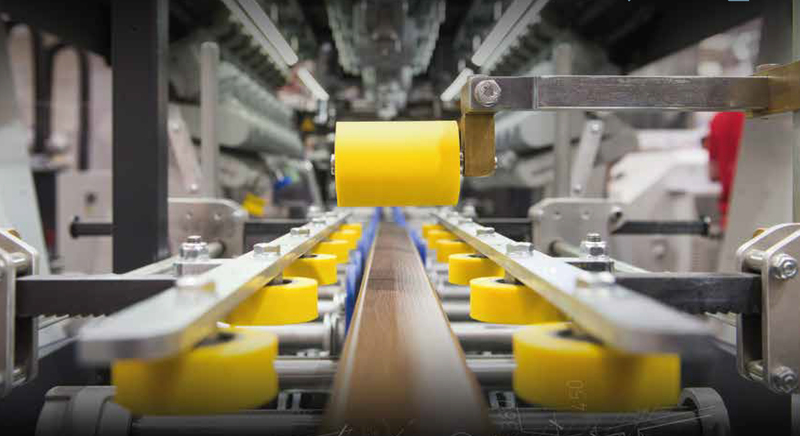 Italy's Italpresse, Komo Machine, SCM, Brown Wood Inc., and Dras Cases were also represented. After spending 50 hours together, many of us became close, and promised to reconnect at upcoming tradeshows like IWF. I even earned a nickname - ‘Wasabi Bobby’ – after I accepted a $20 dare to eat an entire forkful of the Japanese horseradish. The WMIA, PSU, Hague, and PSU professor Charlie Phillips are all responsible for bringing the camp into fruition. Hague and Phillips have been recognized for their efforts, most notably with the winning of the 2015 WMIA Wooden Globe Award for Educator of the Year. “Winning the WMIA Educator of the Year Award was quite an honor in so many ways,” said Hague. “The fact that we were nominated by an attendee of the very first WMIA Boot Camp made it especially special. For someone to leave camp and feel so strongly about the experience to go through the nomination process, well, as educators it meant the world to us and to the program. Hague, Phillips, and professor of wood technology Jordan Backs presented lectures throughout the week and assisted us in the lab. Also helping out in the lab were PSU wood tech graduate assistants Mark Welle and Sam Galliart, as well as current student Kort McDonough. Over the week, myself and 15 students built a small table and cabinet at PSU's 250,000-square-foot wood lab. “They have been with us all the way, putting hundreds of hours into the program in the lab portion, and working with equipment,” Phillips said of Welle and Galliart. The concept of the course was born in late 2013, the brainchild of major machinery supporters Martin, C.R. Onsrud, Timesavers, and Weinig in conjunction with WMIA. “We wanted to see the program incorporate many steps involved in a typical manufacturing shop environment. Boot Camp accomplishes that and gives attendees a concise industry overview,” said Jason Howell, WMIA Education Committee Chair. At the end of the course, Hague, Phillips, and Backs had us take a comprehensive written ‘test’ to see how much we were able to retain over the week. After each day, we had the opportunity express our opinions on things we would change or keep the same about the course. The camp was an exceptionally valuable experience – giving me a broad, exposure-level understanding of the wood manufacturing industry. Getting to keep the coffee table and cabinet I built was the cherry on top – forever existing as reminders of a week I won’t soon forget.